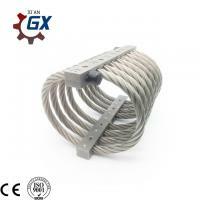 Home Companies Xi'an GX Mechano-Electronic Co., Ltd.
Wire rope isolators are stable mounting assemblies of high quality stranded wire rope held with rugged metal retainers. Each isolating element has specific response characteristic determined by the diameter of the wire rope, the number of strands, the cable length, the cable twist or lay, and the number of cables per section. Inherent damping is provided by flexure hysteresis, i.e., the rubbing and sliding friction between the strands of the wire rope. Wire rope isolators provide higher levels of isolation than any other medium or design, with excellent vibration damping. Cable mounts are truly unique, adapted to a spectrum of physical and engineering requirements so broad that it includes almost every isolation need. They have put to rest the notion that a single mount cannot handle both shock and vibration. Taking GH Series ALL Metal Wire Rope Isolator as example: It has three-dimensional variable stiffness and variable damping characteristics. To meet the aircraft, communications, oil tanks and logging trucks, ocean transportation and other equipment, instrumentation isolation, noise reduction requirements. So that the electronic device can also work in harsh mechanical environments, isolators to replace the traditional ideal. Iridited aluminum bars are standard; however, other materials and finishes can be used. Variations in cable configuration are available if the standard is not suitable. Very fragile (electronic equipment, computer hardware, optical devices). Highly substantial (heavy engines, machinery––during transit or while in operation, even in a moving vehicle). 2:Outer packing: export standard carton or wooden box, foam outside protecting the goods against damage. 1: Customize according to your special demand. 2: Various style for each products and completely series products. 3: Large stock for fast shipping. Established in 2005, Xi'an GX Electronic-Mechano Co., Ltd., a high-tech enterprise specialized in the design and production of vibration isolators, RF coaxial connectors, arresters, locked terminals, LC filters and copper products, is located in Xinkai Industrial Park, Xi'an Hi- tech Industrial Development Zone. We have many years of experience in supplying many kinds of vibration isolators, RF coaxial connectors, arresters, locked terminals, LC filters and copper products (with perfect cost performance by hot extrusion). The company's products are widely used in the fields of electrical and electronics, such as electronic equipments, aviation communication, oil devices and instruments, seismic instruments, ships building, and so on. Take wire rope isolators for example, we have designed and produced ten categories, the load bearing range is from 1kg to 1t, which meets many kinds of requirements and demands from our clients and gets stable customers’ royalty after their launch into domestic market. Our price is very competitive because we are manufactory, we are the source. We are ISO9001:2008 and national military standard certificated factory, so we can ensure the quality. Why is shock and vibration protection so important? Shock and vibration influence the performance and life expectancy of nearly every kind of mechanical and electrical device, large or small. What added benefits do isolators provide? Typically, protection from shock and absorption of vibration is accomplished through the combination of a resilient element (metal mesh, an elastomer, a steel spring, etc.) and a metallic supporting frame. However, the helical isolator, also known as a helical mount or a cable mount, provides a higher level of isolation from shock and vibration than any other type of isolation device. What makes GXs’ isolators so effective? 1. Our helical vibration isolators (also referred to as spring vibration isolators) are made of aircraft quality stainless steel cable, wound into metal retaining bars prepared for surface mounting. 2. The wire rope (ranging in diameter from 1/16” to 1”+) and its helix configuration provide the specific resilience required to cushion fragile loads as small as a few pounds or substantial loads of many thousands of pounds, and absorb vibration through a wide frequency spectrum. 3. The isolator operates well in any position: in compression, extension, shear, and roll. 4. Our isolators provide protection in all axes simultaneously. 5. All-metal construction makes our isolators virtually impervious to severe environments, and maintenance free.